This publication is available online at 00007.html. Except as otherwise specifically noted, the information in this publication may be reproduced, in part or in whole and by any means, without charge or further permission from the Department of Industry, provided that due diligence is exercised in ensuring the accuracy of the information reproduced; that the Department of Industry is identified as the source institution; and that the reproduction is not represented as an official version of the information reproduced, or as having been made in affiliation with, or with the endorsement of, the Department of Industry. For permission to reproduce the information in this publication for commercial purposes, please fill out the Application for Crown Copyright Clearance or contact the Web Services Centre mentioned above. A) What is the Strategic Innovation Fund? B) Who is eligible to apply? C) What is an eligible project? D) What are eligible costs? E) What are examples of ineligible costs? F) What is the application and assessment process? G) What are the contribution amounts? I) What are the repayment conditions? J) What are the reporting requirements during and after the project? Stream 4: Advance industrial research, development and technology demonstration through collaboration between academia, non-profit organizations and the private sector. The program is available to firms of all sizes across all of Canada's industrial and technology sectors. The program is managed by Innovation, Science and Economic Development Canada (ISED). The Applicant must be a for-profit corporation—small, medium or large-sized—incorporated pursuant to the laws of Canada and proposing to carry on business in Canada. The Recipient is responsible for managing the project, submitting claims, receiving and repaying (if applicable) the government contribution and reporting on results. Applicants are a consortium that may include Canadian universities, colleges, research institutes, for-profit corporations (including SMEs) and/or not-for-profit entities. The projects need to have a Lead Applicant which must be incorporated pursuant to the laws of Canada, carry on business in Canada and propose to conduct industrial research and technology demonstration activities. The Lead Applicant will be responsible to submit a project application and manage the project. Networks can also apply under Stream 4. In this case, the Lead Applicant must be a not-for-profit organization incorporated in Canada. Its role will consist of distributing funds to research partnerships consisting of industry, academic institutions and research institutions for the purpose of co-funding collaborative research and technology development projects. The Lead Applicant will be responsible for managing the project, submitting claims, receiving the Government contribution and reporting on results. Each Stream of the program has its own criteria as to what is an eligible project. The project must involve activities related to the research, development and commercialization of innovative products, processes and/or services. Activities in this stream must be within Technology Readiness Levels (TRLs) 1-9 (see Annex A for more information on TRLs) and should support the development of a technology to a higher readiness level which then has the potential to lead to the implementation or commercialization of a resultant product, process or service. Development of process improvements which reduce the environmental footprint of current production through the use of new technologies. The project must support the expansion or material improvement of existing industrial or technological facilities, or projects. Activities in this Stream are within TRLs 8-9 and should result in the improved viability of the Recipient through company growth, increased efficiency or output capacity. Improving processes to increase efficiency. The project must support new investment in industrial or technological facilities in Canada. Activities in this Stream are a minimum of TRL 2 and should support the establishment of new facilities or bring new mandates to Canada. Obtaining an R&D mandate which was previously held outside Canada or is being established for the first time. The project must support industrial research, including activities related to the discovery of new knowledge that aim to support the development of new technology-driven products, processes or services at early-stage technology readiness levels; and, large-scale technology demonstration, including the advancement and development of new technologies into product-specific applications at mid-to-late stage technology readiness levels. Development by a lead Tier 1 original equipment manufacturer company of a potential new product utilizing academic research findings, conjunction with SME suppliers and research councils. Eligible Network activities will be those that facilitate collaboration among key players in the Canadian R&D community, including researchers from industry, national and regional research institutes, and academic institutions, and provide financial support for collaborative projects. The Networks will be solely responsible for assessing, approving and managing the projects they will support. Costs associated with land and buildings must be necessary and reasonable to carry out the activity to which they relate. Examples of eligible land and building costs include the construction of new or the expansion of existing facilities, the development of industrial landscapes and testing facilities, and investments in modern buildings. Additional conditions may apply to project applications that include costs related to land. Under Stream 4, for Networks, eligible costs include expenditures directly related to the operation and activities of the Network such as the costs related to the organization of networking events, the participation in collaborative research and technology development activities, conferences and workshops in support of collaborative R&D activities and the operation of regional offices across Canada. The eligible costs for the operation of the Network include salaries, office equipment, professional services, overhead, travel, and other operational costs as appropriate. The eligible costs of the Network-supported projects will be the amount of money the Network provides to ultimate Recipients for a given project. Certain costs will not be reimbursed, regardless of whether they are reasonably and properly incurred in the context of an approved project. selling and marketing expenses associated with the products or services or both being developed under the Contribution Agreement. Applications for the first three Streams are accepted on a continuing basis. There are no submission deadlines. Step 1 Statement of Interest: Applicants are required to submit a high-level overview of their project. In this document, Applicants need to describe their project and how it meets the objectives of the Strategic Innovation Fund. Applicants will also be asked to provide current and/or past corporate information to allow an initial assessment of their basic corporate capability to complete the project. More detailed information on how to complete the Statement of Interest can be found in the Statement of Interest Guide. After the Step 1 review is complete, Applicants will be provided feedback on whether the Statement of Interest indicates potential for program funding and if advancing to Step 2 is advisable. Step 2 Full Application: Applicants develop and submit a detailed project application. The information provided will be used to complete a due diligence and benefits assessment. More detailed information on how to complete a Full Application will be made available later. The proposed project's expected contribution towards the enhancement or development of new industrial or technological innovations. Assessment factors may include: potential spillover benefits, creation of intellectual property, impact on productivity of the new technology, etc. The proposed project's forecasted impact on the growth of Canadian firms, clusters and supply chains, as well as its expected benefits for Canada's workforce. Assessment factors may include: number of jobs created, number of high-paying jobs, project-related revenue growth, etc. The project's expected contribution to the broader public good, including inclusive business and hiring practices, such as gender balance, investment in skills and training, and environmental best practices. Assessment would consider the degree to which the Applicant demonstrates that the project is expected to generate social, environmental, health, security or other benefits to Canada. Assessment factors may include: project-related environmental benefits, investment in local communities and project-related impact on Indigenous communities. All project applications will undergo a due diligence process where they will be evaluated against the capacity and experience of the Applicant to implement the proposed project, to achieve the stated objective and to fulfill repayment obligations (if applicable). Factors taken into consideration may include managerial, technical and workforce capability, technical feasibility and financial and market risk. Once the assessment of the project application and the due diligence process are complete, Applicants will be informed of the status of their application. The Minister of Innovation, Science and Economic Development Canada will exercise his or her discretion on which projects to fund. Following project approval, a Contribution Agreement will be prepared for signing by the successful Applicant (which then becomes the Recipient) and Innovation, Science and Economic Development Canada, laying out the legally binding responsibilities and obligations of both parties. Applications will be assessed on a competitive basis to identify those projects which will provide strong benefits as outlined above (see benefits assessments section), and which also best demonstrate a commitment to further develop the technology for potential commercialization or research purposes. Networks, in assessing individual project applications requesting support, will consider similar assessment criteria. All project applications will undergo a due diligence process where they will be evaluated against the capacity and experience of the Lead Applicant and that of other Consortium or Network members to implement the proposed project and to achieve the stated objective. Factors taken into consideration may include managerial, technical and workforce capability, technical feasibility and financial and market risk. For funding provided under Stream 4, all Recipients (not only the Lead Recipient) may be required to sign the Contribution Agreement. The amount of the contribution is based on the minimum amount required to allow an eligible activity to proceed. The sharing ratio (contribution vs costs of activities) will be based on the type of activities proposed for a given project. It will not exceed 50% of the costs for eligible activities and the maximum level will only be considered in exceptional circumstances. Contributions will be non-repayable and the program contribution to any Recipient will not exceed 50% of its total eligible costs, except for Recipients that are academic institutions and Networks, where the contribution provided may cover 100% of their eligible costs. If the Recipient is a Network, it may receive 100% of its eligible costs. The combined level of assistance from all governments (federal, provincial, territorial, and municipal), shall not normally exceed 75% of eligible costs. The combined level of assistance from all governments (federal, provincial, territorial and municipal) to any one Recipient shall not normally exceed 75% of Eligible Costs, except for Recipients that are academic institutions for whom the maximum assistance would be 100%. The combined level of assistance provided to Networks from all government sources will not exceed 100% of the total eligible costs of the Network. a combination of 1 and 2. Repayments will be performance-based and reflect a risk-sharing approach. Non-repayable contributions will only be considered for eligible activities that demonstrate strong economic, innovation and public benefits with clear strategic value or global significance (see next section for more information). The amount and terms of repayment will be determined during the due diligence review. The program contains broad flexibilities to reflect the different needs and realities of a variety of companies and other stakeholders. This includes the possibility of non-repayable contributions under appropriate circumstances where the benefits to Canada would be significant, and in keeping with our international obligations. Contributions made under Stream 4 are non-repayable. Recipients are required to submit periodic reports, annual consolidated financial statements, repayment forecasts (if applicable), project status updates and reports of project benefits. After the completion of the project, Recipients may be required to submit annual consolidated financial statements and, annual reports on project benefits including fulfilment of specific commitments. For repayable contributions, Recipients will be required to report on an annual basis for a specified period until all contractual obligations have been met. For non-repayable contributions, Recipients will be required to report, on an annual basis, for a minimum period of five years after completion of the project. Networks will be required to submit an annual Corporate Plan and an Annual Report. Applicants should read and consider all of the following prior to submitting an application. An attestation from key executives indicating that any contributions from the program is not included in the evaluation of, nor be used for, executive performance pay. Recipients must own the background intellectual property or hold sufficient background intellectual property rights to allow their project's activities to be carried out. Additionally, they must hold sufficient rights to permit them to exploit the intellectual property resulting from their project's activities. Recipients must take appropriate steps to protect the intellectual property resulting from activities supported through the program. Recipients may be required to provide the department with information regarding their intellectual property strategy as it relates to their project's activities. The Minister of Innovation, Science and Economic Development Canada is required to release the information to an international or internal trade panel due to a dispute in which Canada is a party or a third-party intervener. Applicants must mark any commercially confidential information in its application as such. Applicants may also wish to become familiar with the terms of the Access to Information Act , which governs the release of information held by federal organizations. 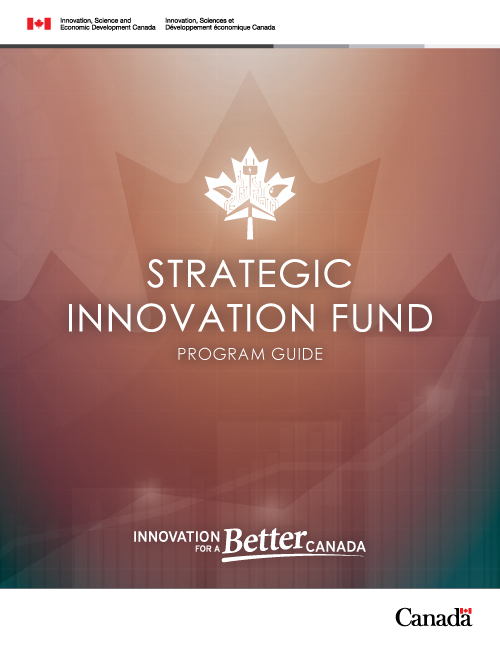 The Strategic Innovation Fund is administered according to Canada's international agreements. Contributions are not contingent, in law or in fact, on actual or anticipated export performance. Lowest level of technology readiness. Scientific research begins to be translated into applied research and development (R&D). Examples might include paper studies of a technology's basic properties. Invention begins. Once basic principles are observed, practical applications can be invented. Applications are speculative, and there may be no proof or detailed analysis to support the assumptions. Active R&D is initiated. This includes analytical studies and laboratory studies to physically validate the analytical predictions of separate elements of the technology. Basic technological products and/or processes are tested to establish that they will work. Reliability of product and/or process innovation increases significantly. The basic products and/or processes are integrated so they can be tested in a simulated environment. Prototypes are tested in a relevant environment. Represents a major step up in a technology's demonstrated readiness. Examples include testing a prototype in a simulated operational environment. Prototype near or at planned operational system and requires demonstration of an actual prototype in an operational environment (e.g. in a vehicle). Innovation has been proven to work in its final form and under expected conditions. In almost all cases, this TRL represents the end of true system development. Actual application of the product and/or process innovation in its final form or function.